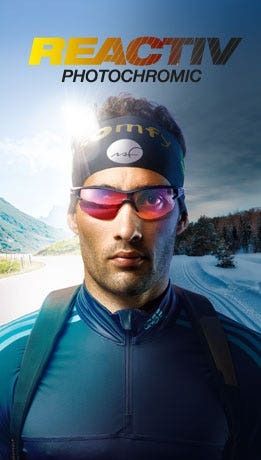 Julbo Spectron polycarbonate lenses are very well adapted for outdoor sports. They are light but offer good impact resistance. Here's a short list of everything you need to know about our Spectron Polycarbonate lenses. We offer six different types of Spectron polycarbonate lenses. The Spectron 3/3+/3CF are versatile and suitable for all sports, while the Spectron 4 guarantees a high level of protection in the mountains and the Polarized 3 and 3+ provide a really clear vision on the water or other situations with a lot of glare. All of our Spectron Polycarbonate lenses offer an extreme suns UV ray's protection (VLT from 13% to 5% depending on the lenses). Our Spectron Polycarbonate lenses are shatterproof. You can run it over, smash it with a hammer, drop them from a 50 story building, they won’t break. The Spectron 3, Spectron 3+ and Spectron 3 CF are slightly different. These three different lenses provide the same sun protections. (VLT 13% for the spectron 3 and VLT 12% for the Spectron 3+ or 3 CF). However the Spectron 3+ produces a mirror effect on the lens to improve filtration of visible light and the Spectron 3 CF is more stylish thanks to the multiplayer flash mirror. Spectron 3 lenses are perfect for performance sports. The Spectron 4 (VLT 5%) is similar to the Spectron 3+, but provides maximum protection against dazzling sun in conditions of strong reflection with the use of an anti-reflective coating. This anti-reflective coating reduces eyestrain and eliminates interference glare. Spectron 4 lenses are perfects for mountain activities. The polarizing filter of the Polarized 3 (VLT 12%) and Polarized 3+ (VLT 11%) eliminate the glare from water surface snow or windshield for a better and clear vision. The Polarized filter 3+ produces the same mirror effect as the Spectron 3+ to improve the filtration of visible light. Spectron 3 and Polarized lenses are appropriate for driving but Spectron 4 is not recommended for driving because the lens is extremely dark. 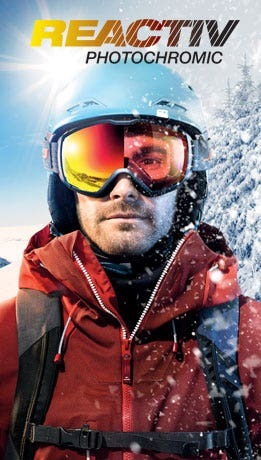 Every Polycarbonate lenses can be used for mountains, performance or water sports. You will choose your lens depending of your light sensibility. A special baby lens is available at Julbo. The Spectron 4 baby provides a maximum protection against Sun's UV rays because babies eye’s need more protection, find here why.